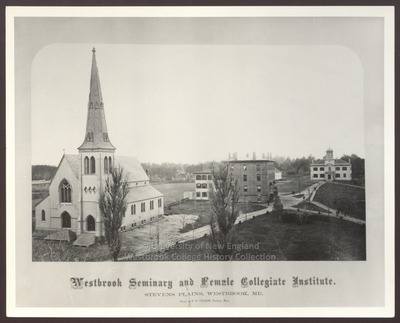 Westbrook Seminary and Female Collegiate Institute was located in Steven's Plains, Westbrook, Maine, in 1868 when this photograph was taken by Augustus H. Folsom of Roxbury, Massachusetts. Historical accounts record that Steven's Plain was a sandy tree-less area used for military practices. The Gothic church in the foreground (later known as All Souls Church) was built in 1867 for the First Universalist Society of Westbrook. The brick Italianate Goddard Hall was built in 1857 and named for major donor Thomas A. Goddard of Boston. The small frame building in the field beyond Goddard Hall was moved from Allen's Corner in 1849 and served as the seminary's own chapel and assembly hall. At the head of the campus stands the original Seminary Building, built in 1834.